Like he does most every day, Andrew E. Slavonic had his Coors Light. But this time, it was straight from the source. The World War II veteran, accompanied by family members, pulled up a chair at Bill’s pub at the Coors Brewery in Golden, Colo., capping a three-day visit from his home outside Pittsburgh. 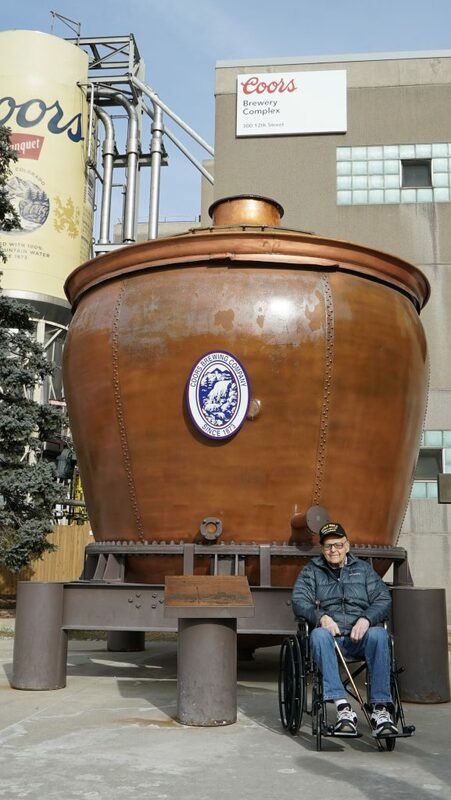 After the spry former Army Air Force aerial gunner was featured in a story on Fox News extolling his daily Coors Light as the secret to his longevity, Coors Light arranged to fly Slavonic and his family members to Colorado to show them around the brewery as a belated 101st birthday gift. Slavonic got VIP treatment in Golden, dining with Molson Coors Chairman Pete Coors and his son, Golden Brewery Quality Manager Peter Coors, at the Coors family estate. He met with members of the veterans group at the Golden brewery, who presented him with an honorary MillerCoors veterans hat. And he got a private tour of the Golden Brewery, complete with an opportunity to sample Coors Light directly from the lines. Slavonic was joined on the trip by his son Bob Slavonic, daughter Susan A. Melzer, grandchildren Jamie Lynn Melzer and Jason Andrew Melzer, and Jason Melzer’s fiancée, Ashley Rose Meyers. The City of Golden also rolled out the red carpet for the family; the Golden Hotel provided their lodging and Jay’s Valet Service carted them around town. Slavonic served as a nose gunner on B-24 Liberators and top-turret gunner on B-17 Flying Fortresses during WWII. He also trained new pilots during the war. His daily Coors Light tradition started decades ago with Coors Banquet. Whenever he finished mowing his lawn, he’d crack open a Coors. “That’s when it hit the spot,” he said. About 20 years ago, he switched to Coors Light. Slavonic said the trip is something he’ll always remember.